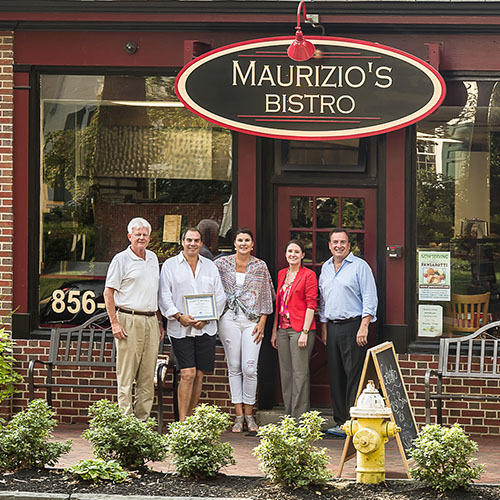 Maurizio’s Bistro received Moorestown Business Association’s first Spotlight Award on Tuesday, July 14 from MBA President and Vice-president Don Powell and Steven Pazienza. Moorestown Mayor Victoria Napolitano was invited to participate as a certificate of appreciation was presented to owners Maurizio and Rosie Randazzo for their outstanding efforts to brighten up the sidewalk areas in front and along the side of their restaurant. Cheerful red umbrellas and sparkling lights canopy Maurizio’s al fresco dining area, where patrons enjoy their meals amid lush planters filled with greenery and flowers. Beautifully tended planting beds frame the front of the restaurant, which is accented with benches that provide a perfect spot to enjoy a gelato. The Randazzos were intent upon making their outdoor area an inviting place for customers, and their efforts add to the charm of Moorestown’s Main Street shopping corridor. Maurizio’s Bistro opened its doors in August of 2014 and was immediately welcomed by the community. ‘We love the town, and enjoy giving back,’ explain the Randazzos, who own a restaurant in Cinnaminson and were excited to open their second establishment in Moorestown where they live and their three children attended school. The Bistro specializes in cooked-to-order meals and artesian pizzas at lunch and dinner, and also serves breakfast on weekends—making it an ideal spot to enjoy spending time in town with family and friends. The MBA is launching its Spotlight program as a means to highlight local businesses that are making a positive impact on the community. From brightening up street-front properties, to supporting charitable causes, to providing unique services and goods for the town, the MBA wants to publicly applaud businesses that are helping to make Moorestown an outstanding place to shop, visit and live. Photo Caption: MBA President Don Powell with Maurizio’s Bistro owners Maurizio and Rosie Randazzo, Moorestown Mayor Victoria Napolitano, and MBA Vice-president Steven Pazienza.